HAWTHORNE, Calif. -- Authorities said a homicide suspect streamed a shootout he was involved in with Los Angeles police officers in Hawthorne on Facebook Live Thursday. Detectives were serving search warrants against four suspected gang members wanted in a March 31 homicide around 10 a.m. A multi-agency task force conducted a stakeout near 117th and Avalon streets when they became aware of one of the suspects driving a vehicle in the area. Authorities said a short chase happened and then ended at the intersection of Aviation and El Segundo boulevards. Hawthorne police officers aided LAPD officers in the chase and Chief Charlie Beck said he believed some Hawthorne police were involved in the subsequent officer involved shooting. At some point, the suspect exited his vehicle armed with a handgun and appeared to be holding his cellphone and streaming on Facebook with his other hand. In the video, you can see the suspect holding a handgun and walking toward what appear to be the officers. As the suspect is walking and talking, you can hear helicopters in the area. Near the end of the video, gunshots are heard and the suspect yells, "They're about to kill me...they got me." The suspect drops the phone and the Facebook Live ends. During the shootout, an LAPD officer was shot in the hip. The officer, who has been with the department for 20 years, was taken to the hospital and is listed in stable condition. 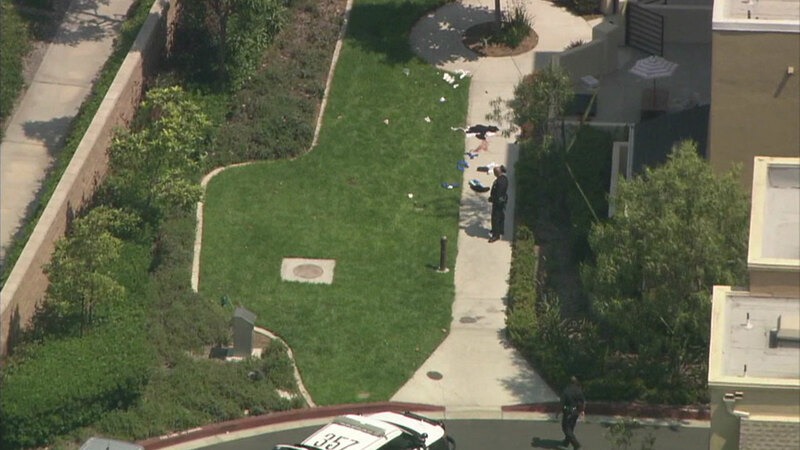 The suspect was in serious condition, according to the LAPD. He was expected to be booked for murder in connection with the March 31 killing, as well as for attempted murder in Thursday's shooting. A witness at the scene, Cory Seubert, said he was driving in the area when he witnessed the firefight. He took some video of the incident, but quickly left for fear of his safety. Other witnesses in the area said they heard gunshots really close to their homes. A friend of the suspect who he said is known as Pee-Wee said his friend just wanted to "get his last words out if it really resorted to death." "He just wanted to let everybody know he loved them. He wasn't going back to jail. He's shooting at the police - that's death right there," the friend said. Pee-Wee's friends and family said they are now left wondering if they've seen him alive for the last time. "It hurt my heart, you know, it hurt my heart thinking that you'f die that way. That's your last words. Your mamma happened to hear them last words," a friend said. Detectives will be using the cellphone video as part of the ongoing investigation.